50003 and 50030 at Darley Dale September 2005 As a publicity stunt, RRRG members were asked which scrapped 50 they would like to see resurrected briefly by disguising 50029. The winner by a good margin was 50003 Temeraire which was scrapped in Glasgow in the early 1990s. As such, 50029 was restored to large logo but with a black roof and red bufferbeams, as 50003 on one side. 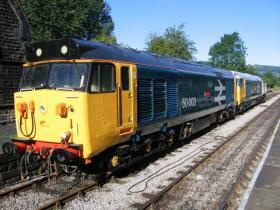 Posed at Darley Dale station on Peak Rail on 17th September 2005 with 50030 behind. Photo: Dominic Jackson. As a publicity stunt, RRRG members were asked which scrapped 50 they would like to see resurrected briefly by disguising 50029. The winner by a good margin was 50003 Temeraire which was scrapped in Glasgow in the early 1990s. 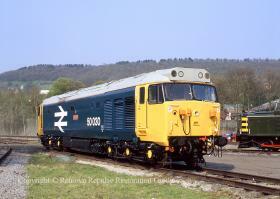 As such, 50029 was restored to large logo but with a black roof and red bufferbeams, as 50003 on one side. Posed at Darley Dale station on Peak Rail on 17th September 2005 with 50030 behind. Photo: Dominic Jackson.